For the last six months or so, I’ve been blogging sparingly about the Insider Preview releases for Windows 10. But a handful of releases have been flying thick and fast over the past three weeks. With all Anniversary Update signs positive, it’s time to let admins know the next major release of Windows 10 is coming. Called Build 1607, it denotes a major release for July, 2016. The smart money says to expect it to hit mid-month, perhaps on Patch Tuesday (July 14). 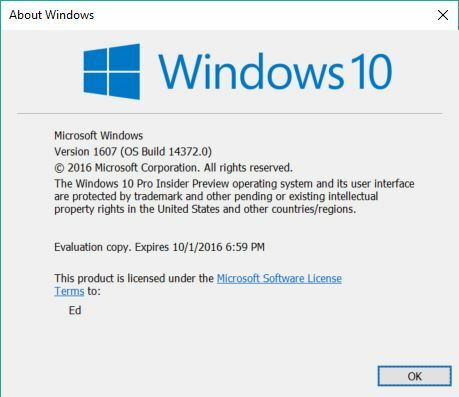 As the Winver output from the latest Insider Preview indicates, the next version of Win10 is 1607. What Makes Anniversary Update Signs Positive? The Microsoft Edge web browser has been substantially revamped and revised since the 1511 version came along. It now supports extensions. Currently these include Ad Blockers, a password manager, and Office Online, a Web-based interface to Word, Excel, PowerPoint, OneNote, and Sway. Edge also provides improved integration with Windows Hello. This means that users on PCs equipped with compatible fingerprint readers or RealSense cameras can use biometrics for website logins. For touch and stylus equipped PCs, Windows Ink adds terrific enhancements to support stylus-based input for handwriting and sketch/drawing capabilities. This comes via integration with built-in OCR and delivery into various apps and applications. Cortana, Windows 10’s voice-based digital assistant gets integrated into many more apps and applications. Cortana will even be available through the lock screen on a properly-equipped PC. MS has integrated a native Linux Ubuntu-based subsystem within Windows 10 (anybody remember POSIX from the NT 4 days?) Build 1607 supports native access to the Bourne Shell (BASH) in the Command Prompt window. Notifications are in for a big makeover, with counts for icons to show how many messages or alerts are waiting for you to check them out. There’s also more visual and direct integration for Universal Windows Platform (UWP) apps. Windows Activation supports links to Microsoft accounts. Thus, you’ll be able to go online when (re)installing Windows 10 to obtain verification of license keys. MS is also loosening policies on hardware changes. You’ll be able to replace a motherboard or other key system components without having to get on the phonereactivate the OS when the machine comes back up. Windows Update gets more controls to make itself more user-friendly. This includes active hours to prevent restarts during times when users are most likely to be actively engaged in work. It also includes restart options to permit suspended updates to force a machine restart without disturbing users. The Start menu continues to get tweaks and new controls to make it more user friendly and customizable. Tablet and fullscreen modes feature a tile-based UWP approach to display. Also, the hamburger button moves to the top left, and the User Profile button to the bottom of the icon column (lower left). Most frequently used apps and applications now show up at the top of the Start Menu, under a “Most Used” heading. There’s plenty more, but that’sa taste of new and expanded features. The OS is also much more stable, and better at preserving (and finding) device drivers through the upgrade process. It’s reasonably quick to install (even on a mid-range i5 hybrid PC, the whole process took under 20 minutes to complete on my Dell Venue Pro 11 7139). In short, there’s a lot of good stuff to look forward to in the upcoming Anniversary Update. Enterprise/corporate users and admins should find it easier to customize, deploy, maintain and use. What makes these Anniversary Update signs positive in the end is that they’ve held up and steadied through a rapid series of updates since the beginning of June. They’ve also survived an onslaught of user input and feedback through the now-ubiquitous Windows Feedback app as well. Will the new 10 allow the use of search engines of our choice? I want to be shed of Bing. I love Bing. Please keep it for me.